Pregnancy is a phase of life in which health-care is at its peak. The mother's physical and mental wellness during pregnancy can affect not only the outcomes of her pregnancy but also the wellbeing of the child later in life. Amongst the many measures one can take to stay healthy, herbal remedies play an important role. 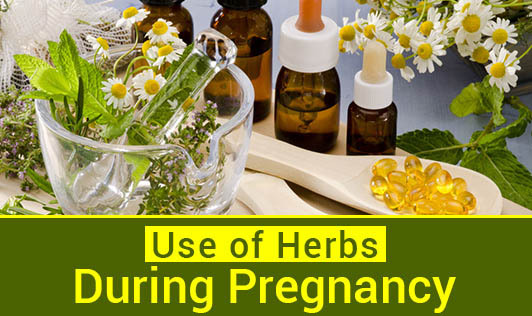 Herbal remedies are considered natural alternatives to certain drugs, but they can also be dangerous when taken during pregnancy. While a cup of chamumile tea is perfectly safe for a mum-to-be, many herbs contain chemicals that can cross the placenta to your baby, and some can cause premature contractions. Culinary herbs such as cinnamon, coriander, caraway, anise, celery seed, marjoram, lovage, oregano, rosemary, saffron, sage, thyme, fenugreek, fennel, nutmeg, and parsley can be used moderately in cooking, but medicinal doses should be avoided as most are uterine stimulants in high doses. Garlic and chili can also be used moderately in cooking, but larger quantities may cause heartburn. Other mild herbs that can be taken occasionally as a tea include: lemongrass, Green tea, lavender, chamumile, and passionflower. All are calming herbs useful in relieving stress and nervous tension as well as promoting sleep. Nutritive herbs such as alfalfa, dandelion, and nettles are abundant in vitamins and minerals and can provide many benefits from a nutritional standpoint. They are best eaten raw like vegetables, but another option is to take in them in tea form. It is best to alternate these herbs when taken in tea form. As with all medications, pregnant women should avoid taking any herb during the first trimester and use only minimal amounts for short periods of time thereafter, and then, only when needed. If you wish to use herbs to treat a problem (rather than to ease symptoms of minor conditions such as heartburn), see a qualified herbalist. And always talk to your obstetrician or doctor before taking any herb or medicine during pregnancy. Unless under the care of a health practitioner, pregnant women should not use concentrated botanicals that isolate a few chemical properties. Also, do not exceed recommended dosage guidelines unless advised to do so by your healthcare practitioner. Although herbs are not necessarily needed by all women during pregnancy, the following herbs are recommended by experienced herbalists and have been used safely by women for centuries. Experts suggest generally choosing herbs that can be eaten as food: nutritive herbs rich in vitamins and minerals such as red raspberry leaf, alfalfa, and dandelion. With these traditional pregnancy herbs the whole plant is meant to be used, preferably eaten as a vegetable (in the case of dandelion greens or nettles) or in some cases taken as a tea or tincture. In this edition we shall see the benefits of two major herbs, but there are more to come. Red Raspberry- It is commonly referred to as "the best all-round herb" for a healthy pregnancy. It's a nourishing, building herb that has an affinity for the reproductive system. This nutritive herb is rich in calcium, magnesium, iron, phosphorus, potassium, vitamins B, C, and E, and the alkaloid fragarine-the constituent that contributes to the plant's potency as a pregnancy tonic. It increases fertility in men and women (especially when combined with red clover), tones the uterus, eases morning sickness, and assists in plentiful milk production. If you have a history of miscarriage, some herbalists recommend that you should delay using the common variety of red raspberry (Rubus idaeus) by itself, especially as a tincture, until after the first trimester. You can then drink one to two cups of tea a day every other day. Also, if your previous labor has been under three hours, red raspberry may be contraindicated. Check with your health practitioner. Alfalfa is loaded with vitamins A, D, E, and K, eight digestive enzymes, and numerous trace minerals. It is particularly helpful in late pregnancy because the vitamin K it supplies promotes proper blood clotting, thereby reducing the risk of postpartum hemorrhage. Let's see the use of more herbs in the next edition.